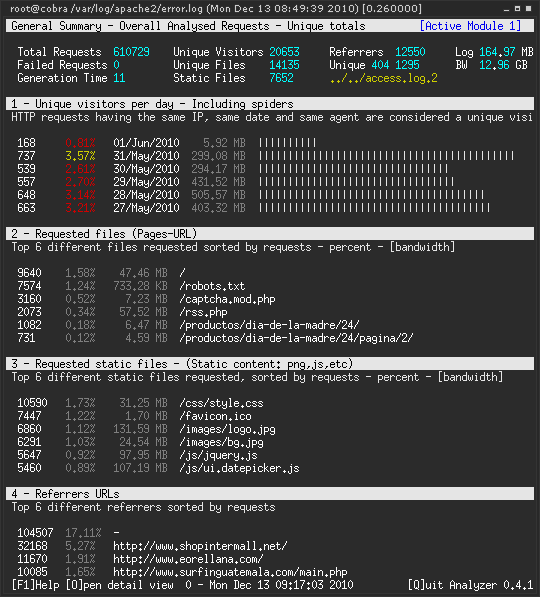 GoAccess is an open source real-time Apache log analyzer and interactive viewer that runs in a terminal in *nix systems. It provides fast and valuable HTTP statistics for system administrators that require a visual server report on the fly. You have to make sure apache or nginx is installed and configured for websites access. -f -- Path to input log file. -b -- Enable total bandwidth consumption. -s -- Enable HTTP status codes report. -a -- Enable a List of User-Agents by host. That will generate an interactive text-only output. The following will get all HTTP requests starting on 05/Dec/2010 until the end of the file. Note that this could take longer time to parse depending on the speed of sed. Excellent little script, although I had to change the single quotes to double quotes to get it to work on my remote webserver, i.e. Forgot to mention it’s not available for Lucid. true, however, you still can install it with dpkg.